It is the last day of the Daily Marker 30 Day Coloring Challenge. I had the great privilege of being one of the Goodwill Ambassadors for Kathy. 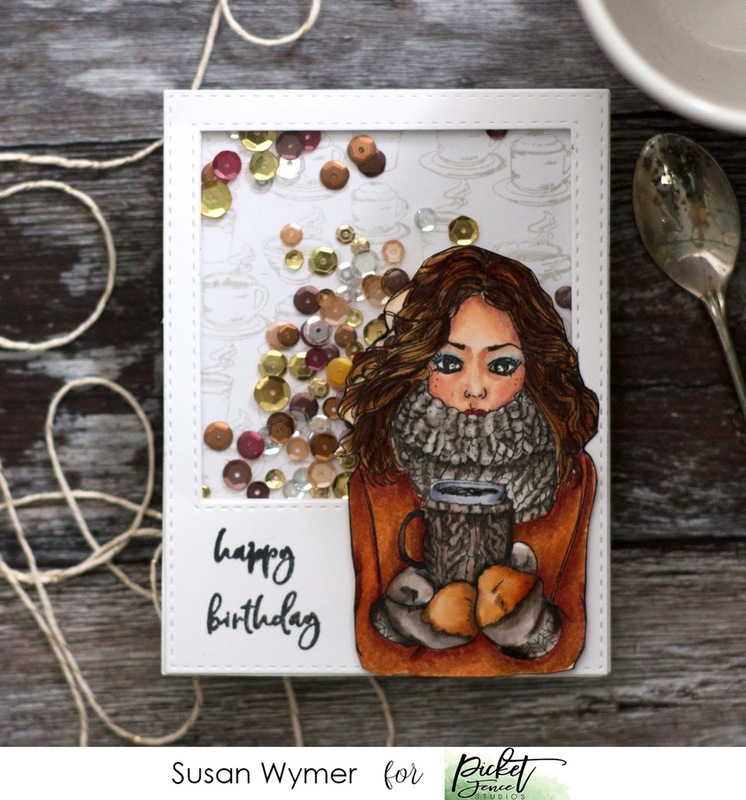 I found some wonderful new-to-me card makers and lots of inspiration as I was going through Instagram and FaceBook. 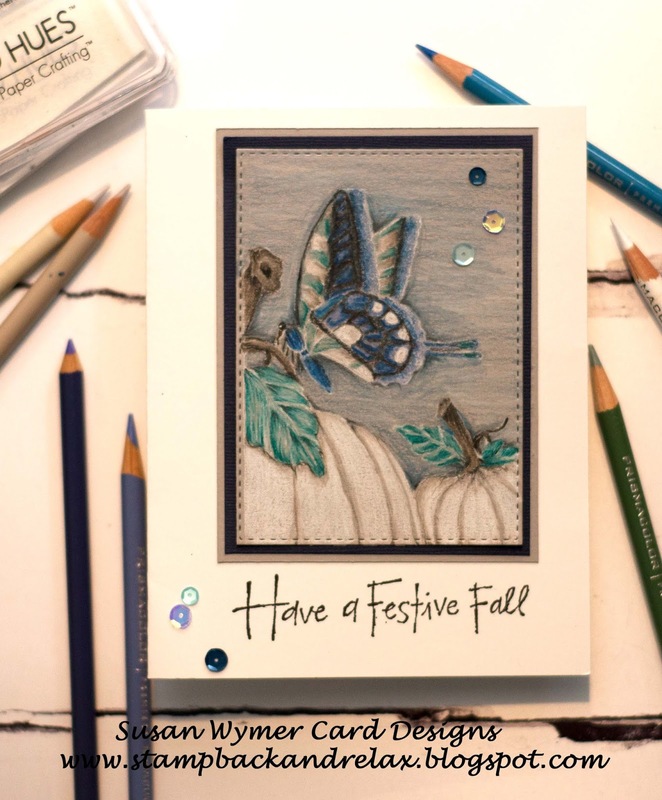 Thank you to Kathy and all of you for this wonderful month of card making and coloring. 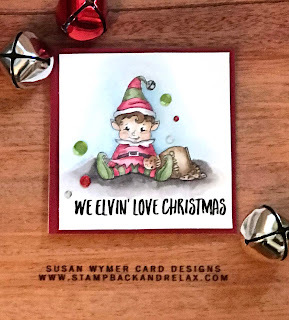 Today I did combine two stamp companies - Picket Fence Studios Inappropriate Santa which has tons of hilarious sentiments and Naughty Elves from Simon Says Stamp which has a fantastic vintage look. I actually got out my Daniel Smith watercolors for this! 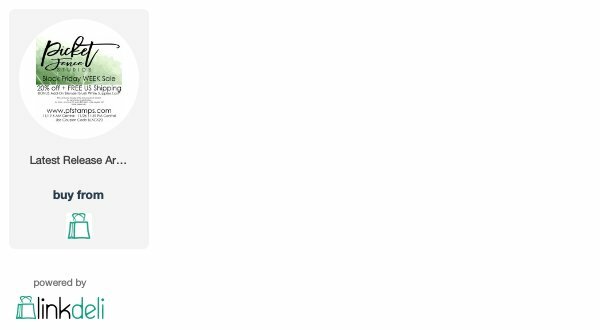 The best thing about this project? I got to use my new custom engraved photo lay board from Wilkerson Handmade, a woman owned, small business. I purchased this board myself after seeing Kathy Racoosin using hers. This board is made from real wood and cut with a laser. I love using it because there is very little glare. It is great for low light situations when I need to pull out my not so good studio lights. I have linked to Wilkerson Handmade below. Shipping is sooooo fast! Links to Products: I am using affiliate links in some cases at no extra charge to you. I purchased the photo lay board myself because I love Wilkerson Handmade products. I was given the Picket Fence stamp set as part of my design team work for them. 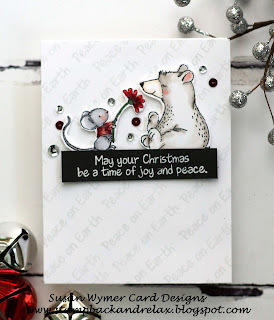 I am up on the My Sweet Petunia blog today with this sparkly card! I used Jennifer McGuire's technique of lifting off Perfect Pearls pigment powder with Versamark. But I added a twist - and this is not a new twist by any means. I inked up a sheet of Neenah Desert Storm with Versamark and applied the Perfect Pearls. I set the Perfect Pearls with water and left the paper to try for 24 hours in my MISTI - drying time may be less if you are in a very dry climate. 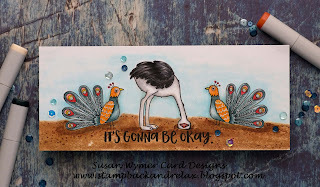 Once the paper was dry, I placed the stamp in my MISTI and applied a thin coating of Deco Arts transfer gel to the stamp and stamped it on to the paper. There is a video below showing the whole process start to finish. Once the transfer gel was dried, I ran the stamped image through my laminator with some gold foil and got this beautiful, distressed foiled background. I wish you could see this in person as it is so shimmery and gorgeous. Products Used: I am using compensated affiliate links at no further cost to you. 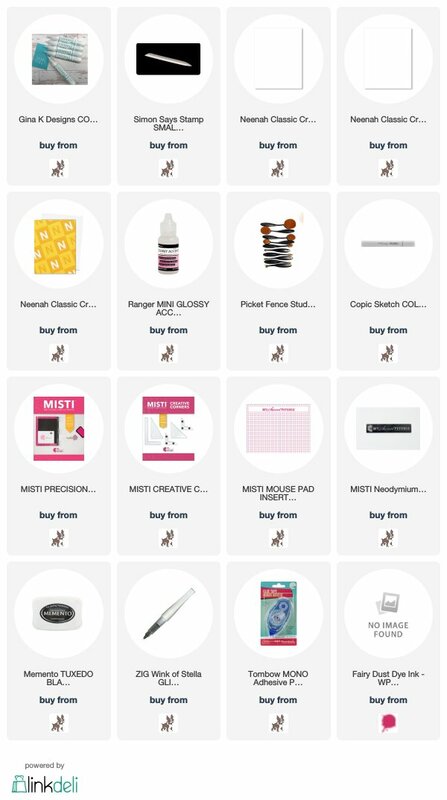 I received none of these products for free. I have purchased them myself because they are high quality and work really well for me. I just had to use her - she needed coffee and so do I after eating all that turkey yesterday!!! 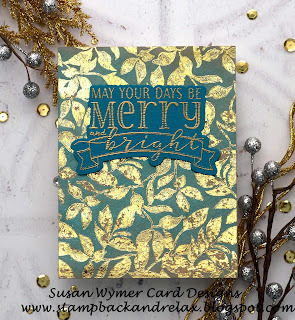 First, I must admit I was heavily inspired by Dawn Woleslage's latest card to use some chunky glitter enamel embossing powder. First, I inked a Neenah 80 lb Solar White panel with Versamark. I then applied Shabby Chic White enamel embossing powder by Stampendous and heat set it. WARNING for those who hate messy desks: even with heating from below first I had chunks of embossing powder all over. Cleaned up easily with a swiffer. 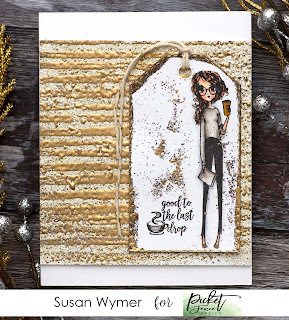 Then using, our new background Rough Around the Edges striped background, I stamped that over the embossed panel with Versamark and applied Aged Gold enamel embossing powder. Oh my gosh such a beautiful, luscious embossing powder. For the tag, I cut that out using a Simon Says Stamp Stitched Tag and then stamped the girl in our new Picket Fence Studios Intense Black Hybrid Ink and colored her in with Copics. 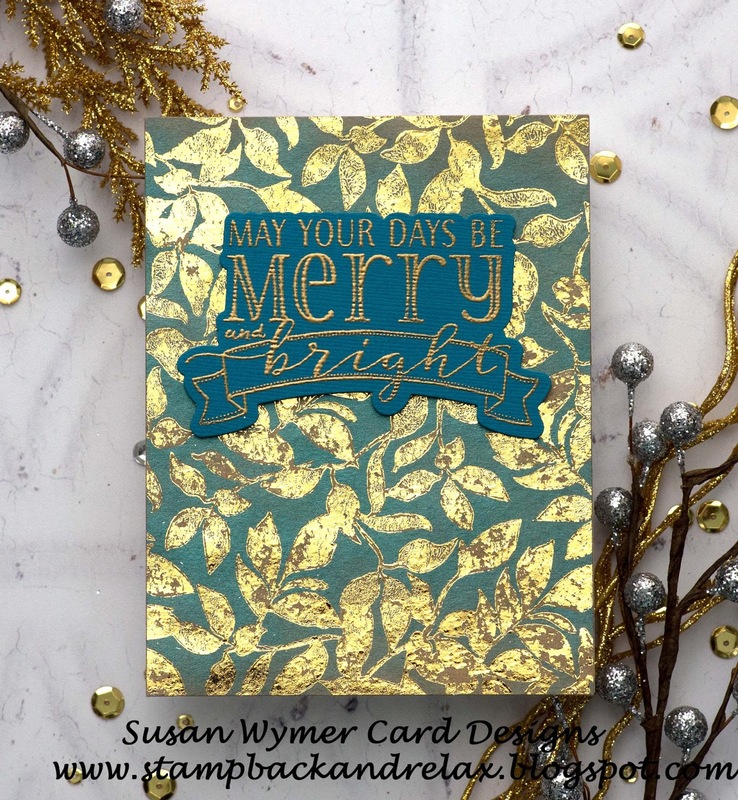 I added the sentiment and sprinkled on some of the aged gold embossing powder. I then trimmed out the main panel and mounted with some foam tape - it will need this reinforcement - onto a Neenah 110lb A2 top folding card! Thank you for stopping by and please head to my You Tube channel above to leave a comment in order to be eligible for the give away! Pants: They stamp a solid black. I am using compensated affiliate links at no further cost to you. I was given the stamps as part of my design team work with Picket Fence Studios. Yes this sale is ALL WEEK LONG!!! Hurry go now lol! Yes I am shopping too for myself HA! Thank you for stopping by! I will be back with more Black Friday Fun! New Release: I am using compensated affiliate links at no further cost to you! I am back with another card from the November release which I adore. These two friends are meeting for coffee after Christmas shopping! This time I mirror stamped the goose from the I Love You Momma set. 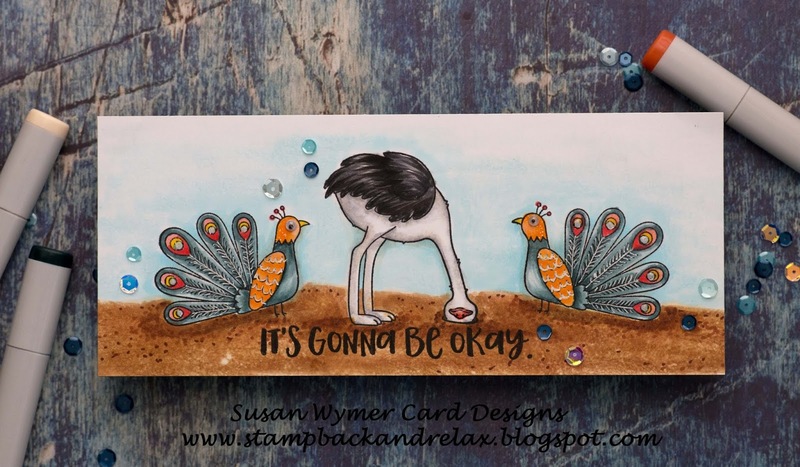 For the mirror image stamping I use a large flat stamp that I flipped and inked up the stamp with Memento - frankly this is my go to ink for mirror images. 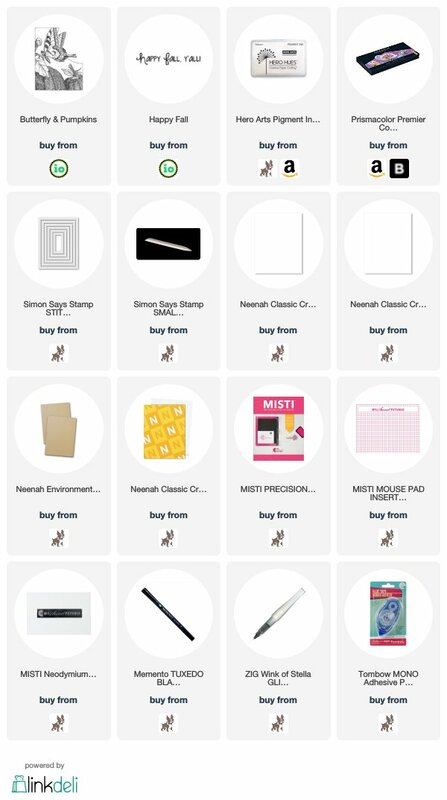 Then I use the image on the stamp to stamp onto Neenah Solar White. Memento Tuxedo Black is the only ink I have success with when mirror stamping. That said, for the other goose I used our new Picket Fence Studios Intense Black hybrid ink. It works beautifully with any medium. For the background I used our new Rough Around the Edges with a bright olive green ink - not sure which one I used - shouldn't clean up before writing things down lol. The coffee cup is from Coffee Understands. Geese: W00, W1 and W5 and R20 for the cheeks. Thank you for stopping by! See you soon! Products Used: I am using affiliate links at no further cost to you. I love and use all of these products which is why I share them. I did receive the stamps for free as part of my design team work for Picket Fence Studios. I am thrilled to announce that I will be guest designing for Impression Obsession for the next few months. I am so exited and honored to work for this company as I have been buying their stamps for years and I really do mean years. The card below was made with two stamps that are about 10-15 years old. They have withstood the test of time both style wise and quality. They both are red rubber cling stamps which I love working with. 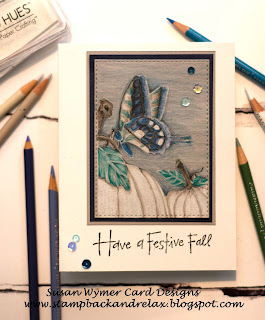 This card is for the Fall Colors Challenge which can be found here. There is a $25 gift certificate to Impression Obsession for the winner. I kept the layout fairly straightforward as this is one of the first times I used my pencils with no line coloring. First, I stamped it in white pigment ink onto Neenah Desert Storm and proceeded color it all in with my Prismacolor pencils. I then die cut it with the medium rectangle from Simon Says Stamp Stitched Rectangles die set. Thank you for stopping by! Please come and play in the challenge here! This release is soooooo good. Just wait for what else we have in store for you. 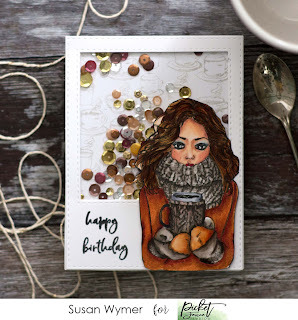 Today I have a card I made using Jill Girl. She looks gorgeous in her chunky yarn scarf. 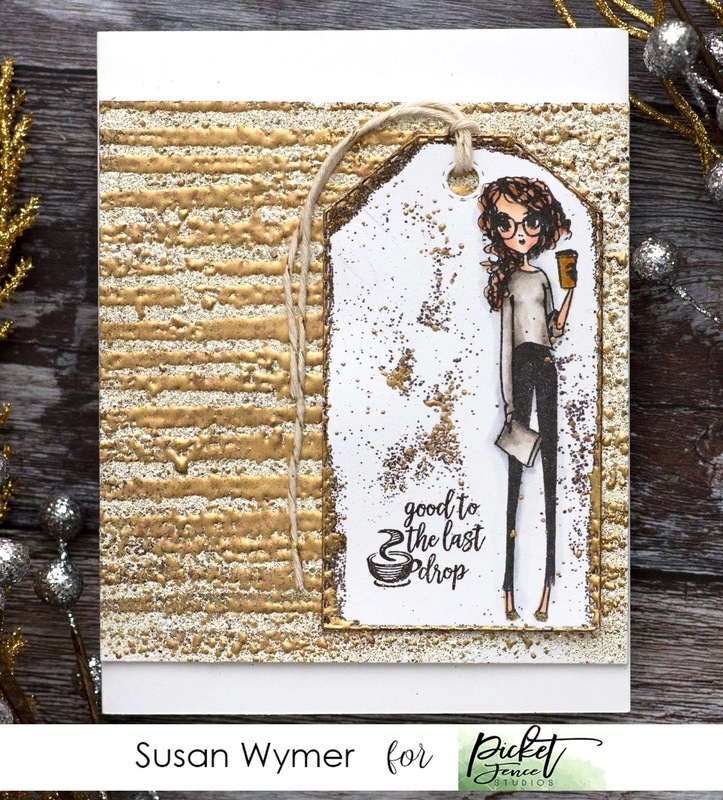 I popped her onto a shaker card background using the Need More Coffee background stamp. I used MFT Cement Gray for the background. The rest of the stamping was done using Picket Fence Studios Intense Black hybrid ink. 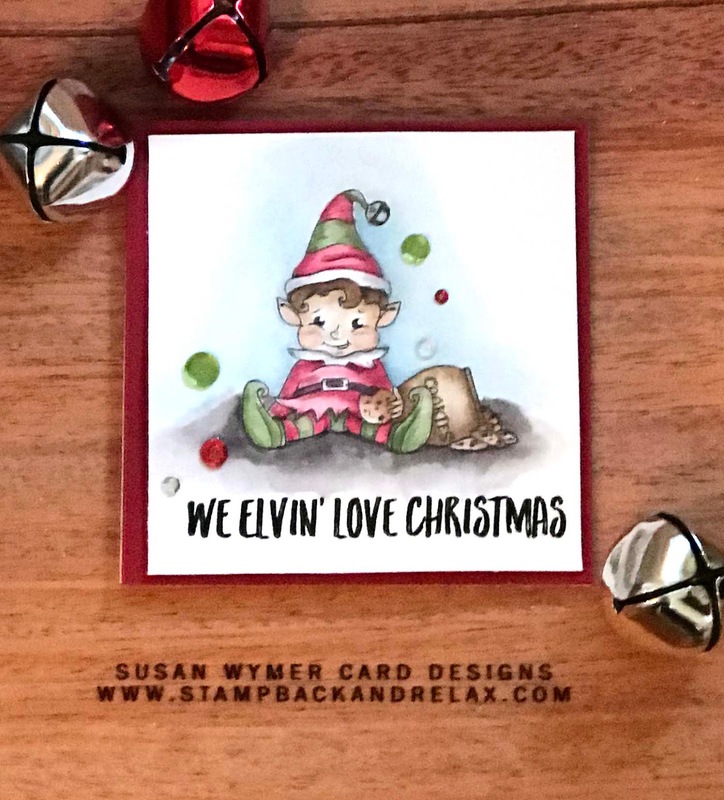 It worked perfectly with Copic markers used in this card and it stamps crisply. I then cut a window in an A2 sized panel using the longest of the Simon Says Stamp Stitched Rectangle die and the mid-sized Simon Says Stamp Stitched Square dies. 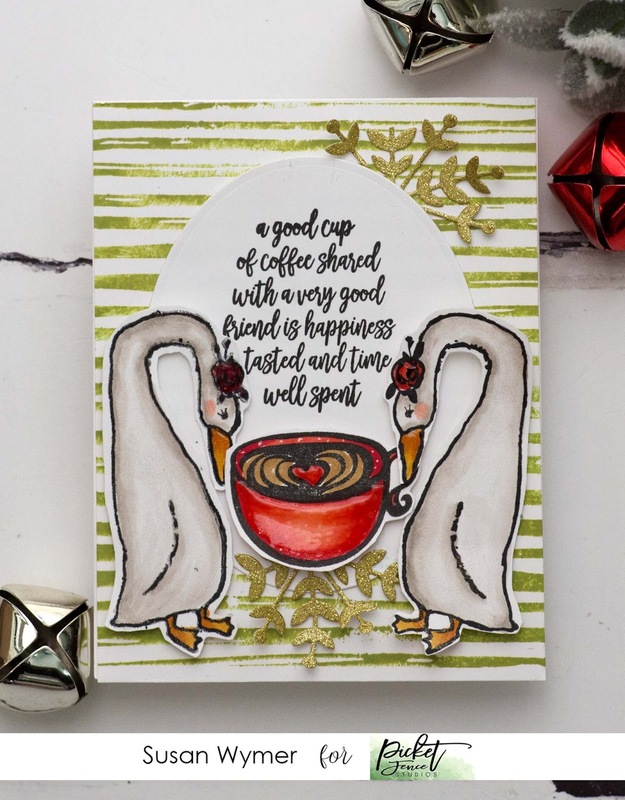 The sentiment is from Picket Fence Studios Kylee Boo. Face: E000, E00, E01, E11 and R20. BG70 and BG72 on the eyes. Coat: I may not have this correctly listed. E99, E97, E13, E07, E09 and YR30. Then I used a rag dampened with Colorless Blender solution to give texture to the coat. Thank you for stopping by! I will be back tomorrow with more from the release! Products Used: I am using compensated affiliate links at no further cost to you. I received the stamps and PFS Intense Black Ink for free as part of my design team work. The complete release is listed below including our new black hybrid ink! First, this hop is a little bit different. The links to the hop can be found on the Unity Stamp Co website or My Sweet Petunia. There is also a hop on Instagram so go over there and hop too for additional prizes! My Instagram account is: @susan_wymer. So for my card I decided to combine stamp sets. One set is a spring set, Oh Splendid Spring, and one is a Christmas set, A Time of Peace! I heavily employed my Misti in all aspects of this project lol! I stamped the background on the diagonal using the Peace on Earth sentiment from A Time of Piece and W Plus 9 Fairy Dust ink. I used the L shaped tool from the Creative Corners set to align the stamp as I went across and up and down the panel. 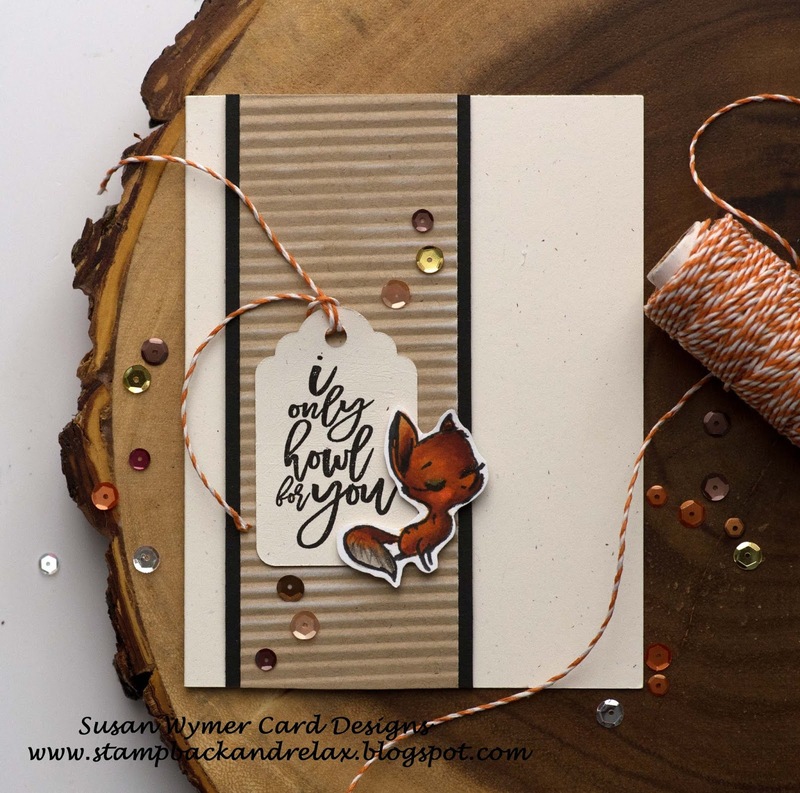 Next, I stamped the focal image - the two critters - from Oh Splendid Spring in Memento Tuxedo Black onto a piece of Neenah Solar White 80 lb card stock. Using my Copic markers I colored in the image and then fussy cut it out. 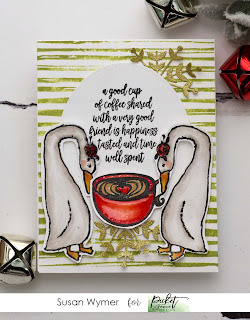 Using my MISTI, I stamped the main sentiment in Versamark and heat embossed with Judikins Winter Wonderland embossing powder. Polar Bear: W00, W1, W3 and a tiny bit of W5. I added R20 to the cheeks and ears. A You Tube tutorial is linked below. 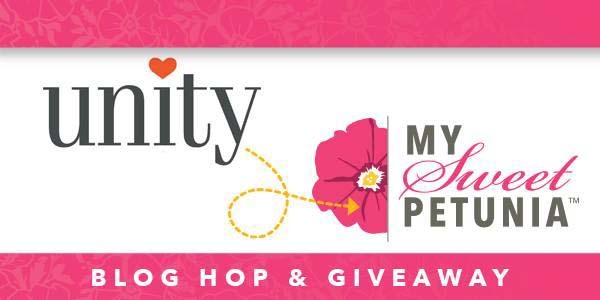 NOW for the BLOG GIVEAWAY DETAILS: We have TWO amazing Unity filled prize packages to give away PLUS a $60 gift certificate to My Sweet Petunia. Leave a comment on EACH design team member’s blog in the hop for your chance to win. You have until Monday, November 12th to leave a comment. Winners will be picked and announced Tuesday, November 13th on the Unity Stamp Company and My Sweet Petunia blogs. Head back to these one of these two places to continue being inspired, and of course, to leave comments! Thank you for stopping by and entering the contest! Products Used: I am using compensated affiliate links at no further cost for you. I was given the stamps as part of my design team work for My Sweet Petunia. I might have gone a bit crazy with this card. I saw the peacocks on a recent trip to My Favorite Things in Eustis, FL. Then, I thought of the ostrich with its head in the sand from W Plus 9 and this large sentiment from Honey Bee. Thus, this business envelope sized card was born. First, I cut a piece of Neenah 80 lb card stock to 3.5" X 9" long for the front panel. Then, I cut a piece of Neenah 110 lb card stock to 3.5" x 9.5". I scored it at 1/2". I then cut another piece of 3.5" x 9". Using Scor-tape I folded the longer 110 card stock over the shorter one to make a side folding card. I stamped all the images in Memento Tuxedo black ink and colored everything including the sand with Copics. I stamped the sentiment in Versafine Onyx black. I was very crafty and pulled out my old paper crimper after I saw that Dawn from W Plus 9 used one this past weekend. 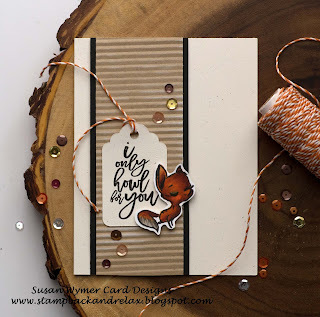 I used a sentiment and image from Picket Fence Studios Crafty Like A Fox. I colored the image with a variety of Copics because I just could leave well enough alone. I have linked up a video below that has a step by step. Supplies Used: I am using compensated affiliate links at no further cost to you. I was given the stamp set as part of my design team work with Picket Fence Studios. I told you in my last post that I was so in love with the theme "families are everything" so I used it again but from Picket Fence Studios. 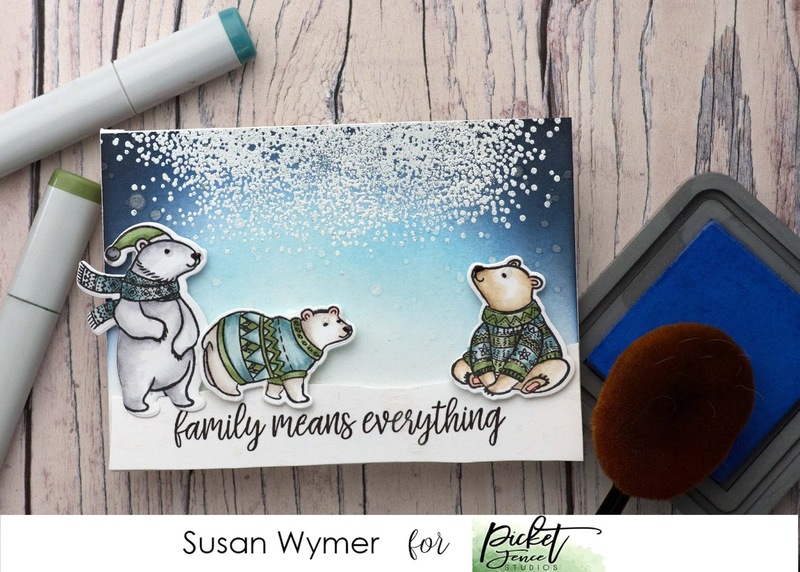 For this card, I used Picket Fence Studios A Bear Kind of Winter to make a scene...well a harmonious scene I hope lol! I started by doing some ink blending with Distress oxides using the Life Changing Blender Brushes onto Neenah Solar White 80 lb card stock. I heat set it and left it to dry. While things were drying, I stamped the bears onto Neenah Solar White 80 lb with Memento Tuxedo Black ink. I then used very few colors of Copics to color in the bears and there hand knitted accessories! The bears were colored with: W00, W1, W3 or N0,N1 and N3 or E41, E42 and E43. I added colorless blender to all to blend these very light colors. Their clothes are colored with BG70 and BG72 and YG61 and YG63. Once the background was dry I carefully stamped part of the large stamp from All That Glitters onto the background with Versamark ink. I used a glittery white embossing powder to form that cloud of snow at the top. I hand cut the snow hill....because on the actual panel I had stamped my sentiment upside down...I was not going back to the beginning. I used my Misti to get the sentiment centered on the hill. I then composed my scene. Easy, fast and fun! I am using compensated affiliate links at no further cost to you. 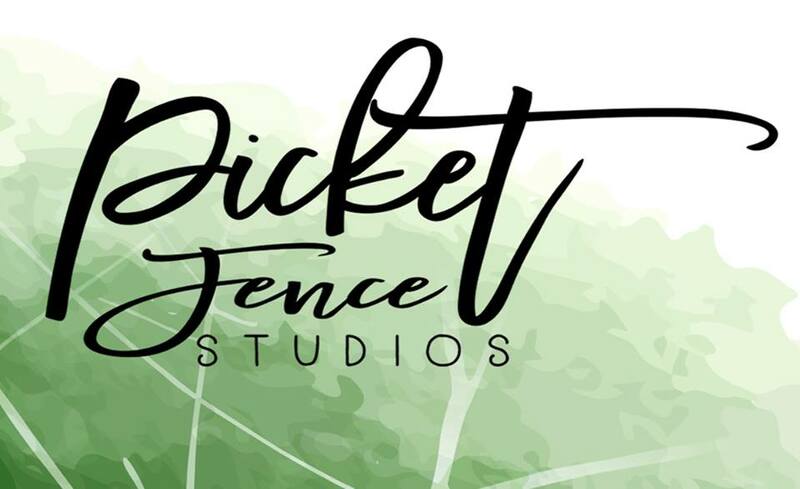 I received the stamp sets and blender brushes as part of my design team work for Picket Fence Studios.